Whether you’re starting on a new email outside of an email campaign or working on one inside of a campaign, there’s an option to duplicate or copy an existing email template. This is a great option for using a similar design and repetitive content from a previous email. When you’re working on an email outside of a Campaign you can easily duplicate an existing email template to get started working on your new email a little faster. 2. 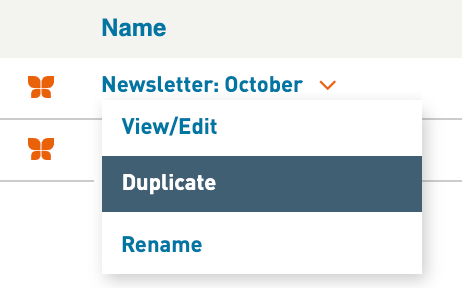 Click on the existing email template that you would like to duplicate and select the option “Duplicate”. 3. From the pop up window, name your file and select Continue. You can choose to give the template a new name or use the name that WordFly assigns. 4. Now your duplicate version is ready to select. You can click on the name and select View/Edit to continue working on this version. 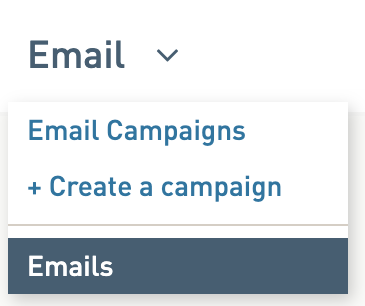 When you’re creating your campaign, just click the Copy existing email button and choose the email you want to copy. Give it a new name and you’re ready to go. 1. Start inside your Campaign under the Email Template tab. 2. Select “Copy existing one”. 3. Select the email you would like to copy by selecting Copy from the right side. 4. From the pop up window, name your file and select Continue. 5. 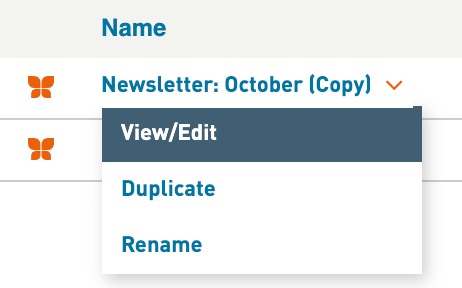 Now your duplicate version is ready to edit inside of the email campaign. You can click “Edit in WordFly” to continue working on your email template.